To meet ERISA reporting requirements, most 401(k) plans must file a Form 5500 annually. This form is designed to disclose certain plan-related information to the Federal government and plan participants. There are three versions of the Form 5500, each with different filing requirements. In general, the largest 401(k) plans have the most detailed - and costly – filing requirements. While a 401(k) provider generally prepares the Form 5500, employers should still understand the filing requirements for their 401(k) plan - otherwise, substantial penalties and avoidable plan expenses are made more likely. This knowledge can also help employers monitor their 401(k) provider – an important fiduciary responsibility – to confirm they’re preparing the Form 5500 timely and competently. What are an employer’s Form 5500 filing requirements? The government’s Form 5500 series includes 3 versions. Generally, the Form 5500 version a 401(k) plan must file for a year is based on its participant count. A description of each version - and when it must be used – is below. For more information, see the DOL’s Reporting and Disclosure Guide for Employee Benefit Plans. Form 5500-EZ – Only “solo 401(k) plans” – which just cover a business owner and their spouse – can file this return. Solo 401(k) plans with less than $250,000 in plan assets as of the last day of the plan year don’t have to file a Form 5500-EZ (or any Form 5500 at all). The plan satisfies DOL independent audit waiver requirements. The plan is 100% invested in “eligible plan assets” with readily determinable fair value (e.g., mutual funds, variable annuities). Form 5500 – 401(k) plans that cover more than 100 participants (“Large 401(k) plans”) and small 401(k) plans that don’t meet the Form 5500-EZ or SF filing requirements must file a long-form Form 5500. Unlike the Form 5500 EZ and SF, the Form 5500 is not a single-form return – it must be filed with certain schedules and/or attachments. Below are the schedule requirements applicable to large and small 401(k) plans. When must an audit report be filed with the Form 5500? Large 401(k) plans (and small 401(k) that don’t meet the DOL’s audit waiver requirements) must file an independent audit report - prepared a third-party Certified Public Accountant (CPA) – with their Form 5500. This report must include an opinion by the CPA regarding the plan’s financial statements - specifically, whether they have been fairly presented in accordance with U.S. Generally Accepted Accounting Principles (GAAP). A 401(k) plan have a full-scope or limited-scope audit. Under a limited-scope audit, the CPA does not audit the plan investment information certified “complete and accurate” by an eligible asset trustee or custodian – which generally makes this audit type less expensive. An audit can add thousands of dollars to the cost of filing a Form 5500, so employers typically try to avoid this requirement by keeping their 401(k) plan’s participant count as low as possible. A popular way to do that is cashing out small account balances related to terminated plan participants. The “80-120 Rule" allows a 401(k) plan with between 80 and 120 participants on the first day of the plan year to file the Form 5500 in the same category (i.e., large or small plan) as the prior year return. This rule makes it possible for large 401(k) plans with between 100 and 120 participants to avoid the audit requirement. How is the Form 5500 filed? The Form 5500 and Form 5500-SF must be filed electronically using the DOL’s EFAST2 processing system. The Form 5500-EZ can only be filed using a paper form. 401(k) plans that must file a Form 5500-EZ can file a Form 5500-SF instead if they want to file an electronic return. What is the deadline for filing a Form 5500? The filing deadline for the Form 5500 is the last day of the seventh month following a 401(k) plan’s year-end (July 31 for calendar-year plans). Can the Form 5500 filing deadline be extended? Yes. An employer can apply for an automatic 2 ½ month extension of time to file their Form 5500 by filing a Form 5558 (extending the filing deadline to October 15 for calendar-year plans). The Form 5558 must be filed before the due date of the Form 5500. What are the penalties for not filing the Form 5500 timely? The IRS penalty for late filing of a 5500-series return is $25 per day, up to a maximum of $15,000. The DOL penalty for late filing can run up to $1,100 per day (as indexed for inflation), with no maximum. However, employers who have not yet been notified by the DOL about their missing Form 55500 can file a late return using the DOL’s Delinquent Filer Voluntary Compliance Program (DFVCP) to pay a lower, flat penalty amount. Under the DFVCP, the maximum penalty for a single late Form 5500 is $750 for small 401(k) plans and $2,000 for large plans. The DFVCP also includes a "per plan" cap. 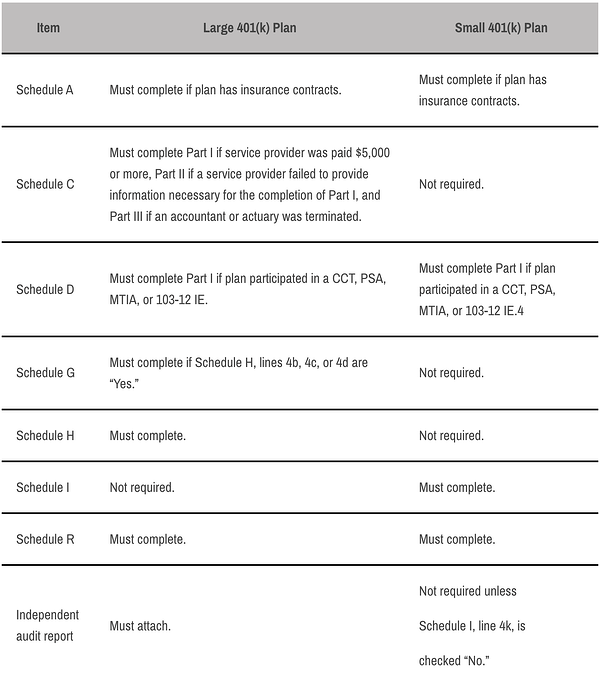 The "per plan" cap limits the penalty to $1,500 for small plans and $4,000 for large plans regardless of the number of late Form 5500s filed at the same time. Are Form 5500s filed in the past publicly-available? Yes. The public can view electronically-filed Form 5500s using the DOL’s Form 5500/5500-SF Filing Search. Must Form 5500 information be disclosed to plan participants? The deadline for distributing the SAR to plan participants is the later of: 1) nine months after the end of the plan year or 2) two months after the Form 5500 was due (if an extension has been granted by the IRS). Understanding Form 5500 filing requirements can save an employer big bucks! Because a 401(k) provider generally prepares the Form 5500, meeting this annual filing requirement is generally a simple process for employers. And yet, not filing a Form 5500 timely is one of the most common 401(k) administration mistakes made by employers – triggering potentially substantial penalties. These penalties are easily avoided when employers understand their 401(k) plan’s filing requirements. This understanding can also help employers avoid a costly audit and monitor their 401(k) provider’s job performance. Receive helpful information like this directly in your inbox by subscribing to The Frugal Fiduciary Small Business 401(k) Blog!